This morning proved So raney and uncertain that we were undeturmined for Some time whether we had best Set out & risque the [river?] which appeared to be riseing or not. Jo. Colter returned haveing killed an Elk about 3 miles towards Point Adams. the rained Seased and it became fair about Meridean, at which time we loaded our Canoes & at 1 P. M. left Fort Clatsop on our homeward bound journey. at this place we had wintered and remained from the 7th of Decr. 1805 to this day and have lived as well as we had any right to expect, and we can Say that we were never one day without 3 meals of Some kind a day either pore Elk meat or roots, not withstanding the repeeted fall of rain which has fallen almost Constantly Since we passed the long narrows on the [blank] of Novr. last  indeed w[e] have had only [blank] days fair weather since that time. 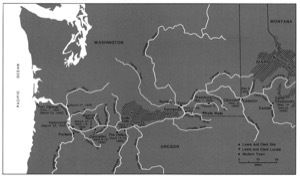 Soon after we had Set out from Fort Clatsop we were met by De lash el wilt & 8 men of the Chinnooks, and Delashelwilts wife the old boud and his Six Girls, they had, a Canoe, a Sea otter Skin, Dried fish and hats for Sale, we purchased a Sea otter Skin, and proceeded on, thro' Meriwethers Bay, there was a Stiff breese from the S. W. which raised Considerable Swells around Meriwethers point  which was as much as our Canoes Could ride. above point William we came too at the Camp of Drewyer & the 2 Field's. they had killed 2 Elk which was about 1½ miles distant. here we Encampd. for the night having made 16 miles. Sunday 23d. There was a cloudy wet morning.— The hunter  who remained out last night, came in early, and had killed an elk. We were employed this forenoon in dividing and packing up our loading; and distributing it among the canoes, which were five in number, three large and two small. 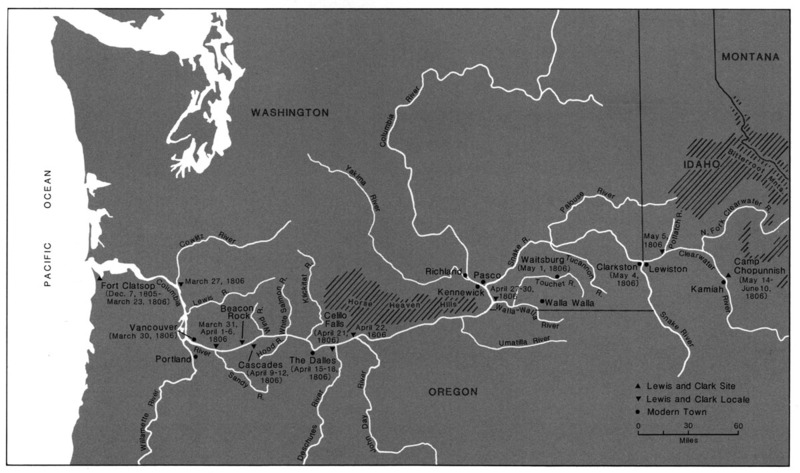 At noon, we put it on board; and at 1 o'clock, left fort Clatsop. The afternoon was fair. We proceeded round Point William, went about 19 miles, and encamped at the mouth of a creek, where we found the three hunters  that had been sent on a-head, and who had killed two elk about a mile and an half distant.